While billions of dollars have gone into African agriculture, smallholder farmers and other food producers are yet to be characterized and structured in ways that give them a recognizable economic identity. Unless value chain actors have a clear economic identity, it will remain difficult for them to participate in a fast-moving global agricultural market where traditional advantages are being eroded. Carving an economic identity includes understanding local markets and accounting for surplus at farm gate. That way it becomes possible to see how much surplus is available for processing and regulate the entire agriculture industry. African agricultural policy makers have to invest in different avenues of generating and interpreting data in order to optimize data capture and integration. For instance, a single smallholder farmer generates thousands of data points daily beyond basic details like size of household and farming category. Integrating disparate data such as hundreds of decisions made by each farmer daily is very important. Besides lack of standardization of data so that it becomes easy to share, data sharing is hampered by numerous factors, including inadequate financial and nonfinancial incentives. For example, regular data capturing and sharing has not been adequately written into job descriptions of government extension officers. These officers are only invited to participate in ad hoc crop and livestock assessments. As a result, it is impossible to introduce new and novel ways of gathering evidence in real time if potential data collectors are not equipped with the basics. Extension officers are not paid on the basis of data collection efforts, encouraging farmers to participate in research or conducting experiments but on high yields by farmers. In addition to providing adequate data collection infrastructure and financial incentives, policy makers should improve data governance and introduce approaches that enable farmers and other value chain actors to participate directly in data gathering and sharing. As if that is not enough, much of the data currently being collected by government departments, contract companies, mobile service providers and development organizations from farmers and rural communities lack some critical nuances that can pinpoint real solutions. Continuous data flow should be an integral part of the decision-making hygiene in agricultural value chains. It is not enough to assess crops and livestock in farming areas without extending such efforts to what is in the market and household food storage. Assessing food security among farmers and rural dwellers is not enough without considering deficit and surplus situations in urban populations. In most African countries, urban populations consume more than 50% of the food produced in each country. Most farmers do not consume as much as they produce due to post-harvest losses and a desire to earn income from selling to urban markets where buying power is concentrated. Ideally, each community should have statistics showing how much is produced, sold and consumed locally. Trying to flesh economic identities for farmers by looking at the availability of resources like access to loans, soil, water, irrigation and pack shades is a common mistake by policy makers and financiers in African countries. A more complete economic identity can come from taking into account intangible attributes such as knowledge, attitudes, risk appetite, patience and other hidden factors. Due to absence of robust characterization, it is difficult to identify farmers who specialize in specific commodities who can then be upgraded to participate in export markets. Sampling 50 farmers from a total of more than five million to participate in exports is not a viable initiative. The majority of farmers engage in trial and error by trying potatoes one season, cabbages next season and peas the following season, based on short-term incentives. Given the extent to which informal markets dominate the supply of food to urban consumers in most developing countries, an effective data collection system can turn these markets into a food toll gate that can efficiently inform the entire agricultural sector. Introducing plastic money continues to be a challenge due to lack of a system that can enable the introduction of plastic money at the local farmers’ market and link it with other local actors before connecting with national institutions. In the absence of a system, a few informed actors continue to prey on the system and deprive farmers of benefits that should accrue to them. Collecting statistics for one commodity like tobacco and ignoring more than 50 other commodities translates to unbalanced economic decision-making. Strengthening the system starting from local farmers markets will make it easy to introduce an export facility directly to farmers. 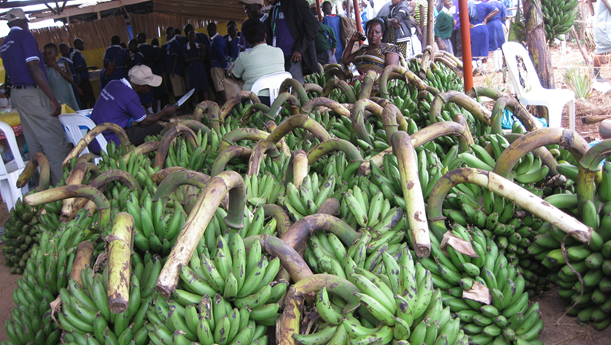 Farmers able to produce for export can be assessed from their participation in the local market. This entry was posted in agri-bussiness, Agricultural Intelligence, Agricultural Markets, eMKambo. Bookmark the permalink. This is quiet a strong angle you are bringing here Sir. Its quiet sad how we as an industry are literally doing business in the dark. Data capturing is a must and now!